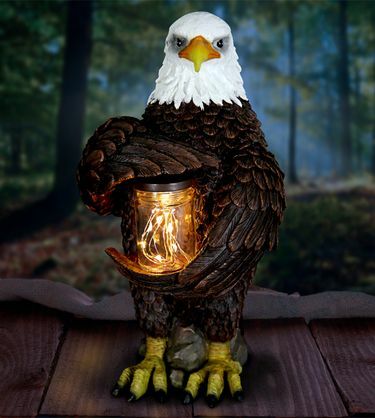 This solar regal eagle holds a magical jar of glowing LED firefly lights! A string of 6 solar powered LEDs will magically illuminate in the jar at dusk bringing this adorable garden art to life. An endearing addition to your garden decor. Solar powered by 6 LEDs that automatically glow at dusk for an enchanting decorative light! Made of durable resin, UV treated to resist fading. Size: 7.25" x 6.5" x 12"H., approx. 3.5 lbs.